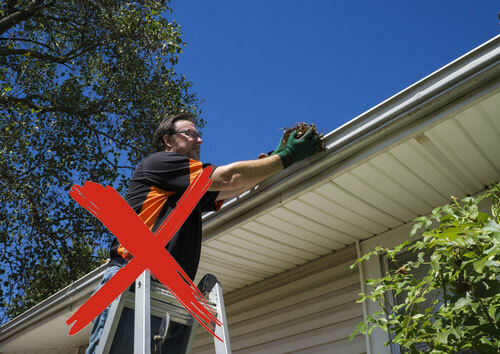 Cleaning your gutters can be very painful if you are already experiencing back pain and a dangerous task that can lead to back pain if you are not careful. Most of the time, when thinking of cleaning your gutters, you would get up on a ladder so you can reach the gutters and give them the thorough cleaning they deserve. However, this puts you at a high risk of falling, which can lead to a lifetime of pain. The list below will provide some options of how to clean gutters without a ladder so that you can help prevent back injuries and avoid additional pain. The gutter sense gutter cleaning tool was designed to make cleaning gutters from the ground a reality. It can be attached onto an extension pole and has been advertised to reach a two story gutter and grasp onto all types of debris including pine needles. The gutter sense gutter cleaning tool features tongs that are intended to run flat into the gutters even if the extension pole is canted. Keep in mind that although the gutter sense cleaning tool is made out of a durable glass-filled nylon, it is still plastic and can break easily if it is not handled with proper care. In addition, it works best on K style gutters with flat bottoms and may not work with other types of gutters. A gutter vacuum is another option for cleaning gutters from the ground. If your gutters are mostly filled with debris such as pine needles, twigs, and dry leaves, you can vacuum them out without getting on a ladder. Many times, these gutter vacuum attachments will fit well on the end of a leaf blower or Shop-Vac. They work by curling over the edge of a gutter and sucking the debris into a vacuum chamber or bag. This solution is often ineffective as it does not work to get all of the junk out of your gutters. The gutter flusher is another answer to how to clean gutters without a ladder. It uses a high-powered jet stream hose attachment to blast away gutter debris that can lead to a variety of costly and annoying damages. Most gutter flushers come with extendable metal poles which can be attached to any garden hose. This solution can make quite a mess as water and debris fly everywhere. It also has been shown to not get all of the gunk out of your gutters. View complete article here, originally published on leaffilter.com.